Home » About » Hire Us! We offer a unique opportunity for you to make use of a large male choir in productions. Movies, videos, major gatherings and celebrations, cultural events, or even large private events are possible uses for our choir's persona. We have a wide range of rehearsed song titles ready to go, and we can learn a tune or two on demand. Heck, our Music Director Jonathan Quick can even arrange a composition to suit. Seriously, it's not every place you can find such a large group of trained male voices in tux who can wow your audience with the powerful sounds of bass and tenor harmonies. If the idea piques your interest and you think we might be able to help you, send us an email and we can talk. Interested in booking the Vancouver Welsh Men's Choir for your theatre or concert series? We have performed before large audiences in Vancouver's Chan Centre for the Performing Arts, West Vancouver's Kay Meek Centre, the ACT Theatre in Maple Ridge, the Surrey Arts Centre and the Bell Centre for the Performing Arts in Surrey, the Massey Theatre in New Westminster, Michael J. Fox Theatre in Burnaby, the Clarke Theatre in Mission and the Kelowna Community Theatre. We have made regular appearances in the Surrey Arts Centre concert series for several years. We have also appeared many times in smaller venues including churches and community halls across the province. Our performances have often included guest artists such as the UBC Opera Ensemble, Lions Gate Chorus, Voca Java, I Tromboni and Winter Harp. What about a benefit concert to raise funds for charitable causes? 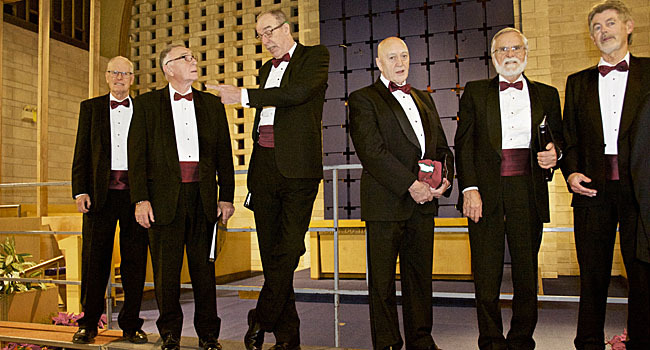 For a fee to cover basic expenses, the Vancouver Welsh Men's Choir will perform on behalf of your group. We can also help with ticket and program printing and publicity if you wish. Recent benefit concerts helped the UBC Faculty Women's Club and the Auxiliary of the Vancouver of Theology raise thousands of dollars for student scholarships by attracting audiences in the range of 500 people. We have also performed at fundraisers on behalf of the Variety Clubs of BC, the Canadian Red Cross, Operation Eyesight, Lions Gate Hospital, the Burnaby Arts Centre, the Fraser Valley University Fund, the Ladner Boys and Girls Club, the Canadian Orthopedic Society, Tsunami Relief, and there are many more. We tour regularly outside the Vancouver region. During our 2007-8 season we performed in Powell River, Pender Harbour, Kelowna and Osoyoos. Previous tours have taken us to Vancouver Island, the Gulf Islands, the Kootenays, the Cariboo and the central interior, often to sing with local choirs. If you would like us to visit your community, all it takes is a telephone call or email to inquire about the possibility. It helps to enlist the aid of your community arts organization or a local choir to sponsor a visit. We plan our concerts at least 12 months in advance, so it's best if you contact us early to get the ball rolling. For further details contact the Chair of Concert Scheduling and Planning at [email protected] . We can promise you a great show!